On a whim, we asked Russell’s parents to join us for our trip to Buck Mulligan’s Public House in 5pts South. If you haven’t guessed by now, we love sharing our Birmingham Restaurant Week experiences with friends and family and we highly recommend that you do the same! We headed over on Sunday afternoon and were greeted by our server who was wearing a Unicorn Onesie (sorry but we forgot to snap a pic)! Bonus points to Buck’s for Pajama Brunch!!! We said hi to the owner Danny, who also owns Crestwood Cafe. As per usual, Danny was all smiles and excited to once again be involved in #BRW2016. 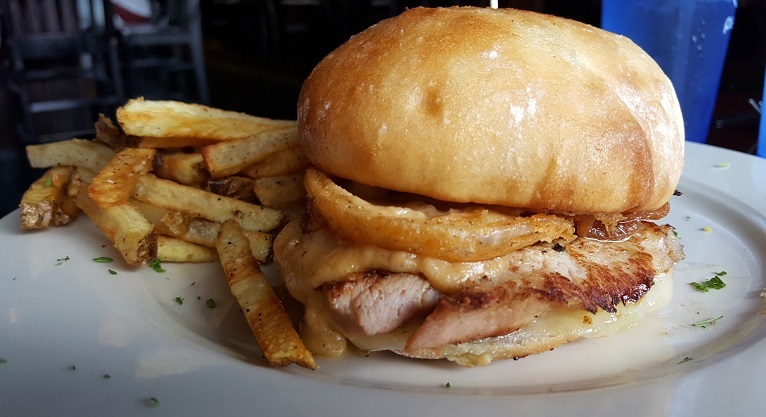 Rasher Grilled Cheese - butter grilled bianco roll stuffed with crispy fried onions, house-brined Irish rasher, Swiss cheese, and house-made Guinness beer cheese. Served with house-cut “chips.” What the heck is Rasher?! Well, think thin pork chop. The sandwich was warm, melty, and VERY filling! The “chips” are seasoned house made fries that we could have eaten by the bag “Five Guys” style. 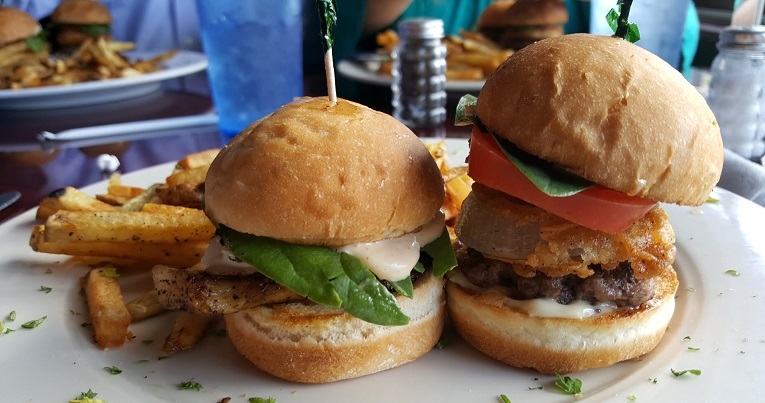 The Mulligan Burger, Guinness Burger, Cod (1 Grilled & 1 Fried), and Chicken (1 Grilled & 1 Fried). They were all delicious in their own way. There wasn’t a single one we didn’t enjoy. The Cod was especially good! Also available are the Rasher and Corned Beef sliders which we will have to try later. There were three different dessert options, so obviously we had to try them all between the four of us! Guinness Pot De Crème is an Irish twist on chocolate pot de crème and is like a creamy dark chocolate mousse! We aren’t sure, but there’s a good chance that it has Guinness in it. It was VERY rich and all around delicious! Irish Bread Pudding is made using Buck’s Secret recipe with an Irish whiskey sauce. It was warm, spongy, and filling! Be sure to save some room for this one! Strawberry Rhubarb Cobbler was the daily special and is warm with a tart taste that makes it a perfect summer dessert! 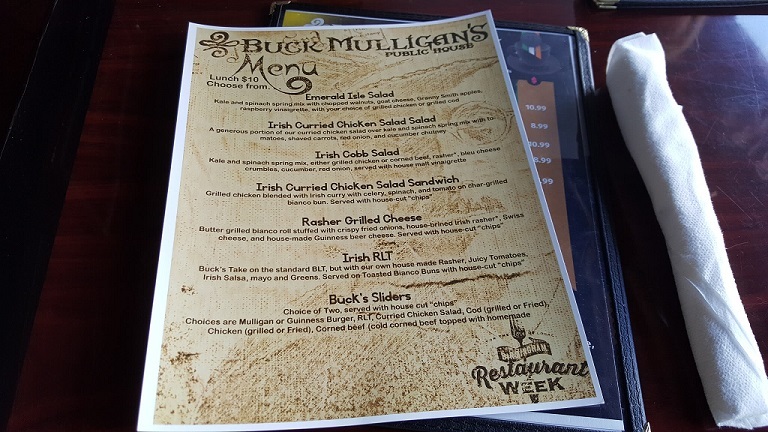 Buck Mulligan’s is a great casual spot with authentic Irish food. It has quickly become a crowd favorite in the 5pts restaurant scene. We can definitely see why! You have got to try it for yourself!